It’s nearly impossible to walk around any tourist attraction in Boston, MA without finding some kind of souvenir with a so-called, famous quote by Benjamin Franklin stating, “Beer is proof that God loves us and wants us to be happy”. While this may seem like a reasonable quote, there is no clear evidence of Benjamin Franklin ever stating this. Benjamin Franklin often wrote letters to his friends while he resided in France in the late 1700’s. One of these letters contained a similar quote about wine, however this states something slightly different. 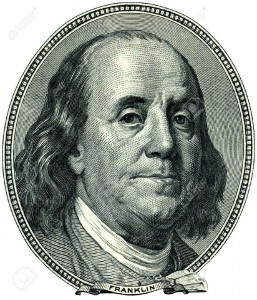 One might say that Benjamin Franklin was almost a wine connoisseur—as it was one of his favorite drinks. Clearly there was a misinterpretation somewhere in history when people decided that Benjamin Franklin made a statement about beer and God. 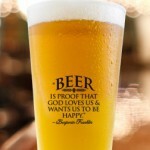 So, the short of it is that Benjamin Franklin never did in fact make this falsely famous quote about beer. How much do you know about Franklin? Here is a quiz about Franklin–let us know how you do! Posted on April 29, 2016 Author professorallison5 Comments on How much do you know about Franklin? Snack Committee just wanted to get everyone excited for the honors palooza by sharing the specialties of this feast. Have a taste of apple jam with a nice crusty French baguette, and take yourself back to Franklin first arriving in Philadelphia and having little money to his name and rejoicing at the abundance of bread he was able to purchase with his little financial means. Not a fan of apple jam? Sink your teeth into some nice American cheddar cheese, patriotic to the last bite just like good old Ben Franklin. Looking for something different to snack on? Enjoy one of Franklin’s favorite snack, some nice pickles. I know you’re probably worried about what to wash this all down with don’t worry, snack committee has you covered. Enjoy some delicious sparkling grape juice in place of Franklin’s favorite red wine. I hope you’re as excited as we are; can’t wait for you to feast like a Founding Father! 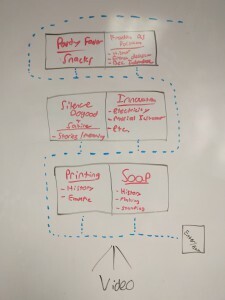 After much deliberations the Soap Commitee Action Task Force has reached the final phases of planning for our segmant in the Honors symposium. We have decided on a soap carving contest, as making soap is often too time consuming and dangerous for such an event. We feel this would be a good way to attract attention from passers by, as well as gather enough people in the area to have a disscuion about how one actually made soap in the 1700’s and how this realtes to Franklin’s life. In the 1700’s it was common for a son to follow in his fathers profession. As the son of a soap maker, history wouldve expected Franklin to become one aswell, luckily for us, this did not happen. Franklin’s father, having the foresight to diversify the traits of his offspring lead the young Benjamin to persue a life outside of the humble makings of soap. While Franklin never did end up a soap maker like his father, its an important part of his life story. Benjamin Franklins’ fathers pefession, in contrast to his future acomplishments tells alot about him as a person, and makes his life that much more eventful in comparison. This will be the layout for the showcase. This is food Ben Franklin would feast on. Delicacies good enough for the genius Franklin himself. Let your taste buds take you back to a time of Creativity and Innovation and enjoy the snacks of our founding fathers. Ashlee and I are looking for pictures relevant to Franklin’s life that may have been taken by students throughout the semester. If you do have any photos, please email them to me asap so that we can begin putting a presentation together. I’m currently working on making a poster to represent Franklin’s “Silence Dogood” essays. I haven’t decided exactly what ones to do yet, but if anyone has suggestions let me know! Walking around the streets of Boston, one may see a person wearing a shirt or see a souvenir beer glass with the quote, “Beer is proof that God loves us and wants us to be happy” with the credit of who said it being given to Benjamin Franklin. He is talking about wine in this quote, not beer! So, it is clear that Franklin had been misquoted, but most likely on purpose. Any tourist looking at a souvenir with this made up quote and being unaware of this little distortion of Franklin’s real quote would most likely find it comical. They would read the quote about beer, see it associated with a famous person who many people are knowledgeable to some degree about, and buy it. This allows the item to be popular, ultimately making it a selling point and helping businesses make a profit off the items. Franklin was a funny man, writing about farting and other comical things, but there is no actual documentation of Franklin saying these exact words about beer and God loving us in this famous misquote.